The bael fruit tree is slow-growing, of medium size, up to 12-15 m tall with short trunk, thick, soft, flaking bark, and spreading, sometimes spiny branches, the lower ones drooping. The deciduous, alternate leaves are composed of 3 to 5 oval, pointed, shallowly toothed leaflets, 4-10 cm long, 2-5 cm wide. New foliage is glossy and pinkish-maroon. Fragrant flowers, in clusters of 4 to 7 along the young branchlets, have 4 curved, fleshy petals, green outside, yellowish inside, and 50 or more greenish-yellow stamens. The fruit, round or oblong, 5-20 cm in diameter, may have a thin, hard, woody shell or a more or less soft rind, grey-green until the fruit is fully ripe, when it turns yellowish. It is dotted with aromatic, minute oil glands. Inside, there is a hard central core and 8 to 20 faintly defined triangular segments, with thin, dark-orange walls, filled with aromatic, pale-orange, pasty, sweet astringent pulp. 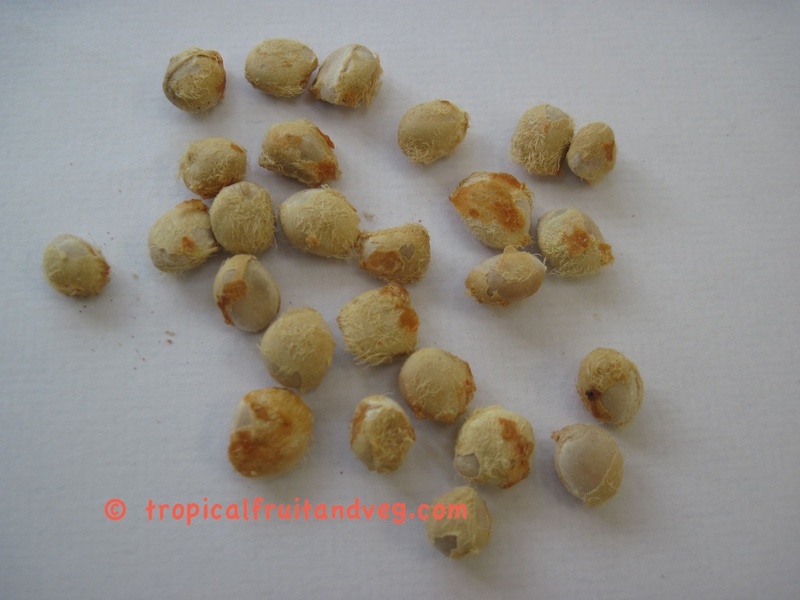 Embedded in the pulp are 10 to 15 seeds, flattened-oblong about 1 cm long. 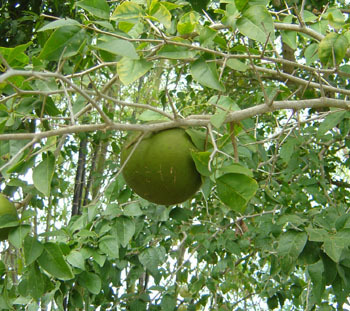 Bael is used in Ayurvedic medicine. Fresh half-ripe bael fruit is mildly astringent and is used in India for dysentery and diarrhoea; the pulp may be eaten or the decoction administered. The dried fruit does not contain the constituents requisite for the preparation of the decoction. It is said to cure without creating any tendency to constipation. The bael fruit tree is a subtropical species. It can grow in climates that vary in temperature from 48� C and -6� C in the winter. The bael fruit does best on rich, well-drained soil having pH range from 5 to 8. In India it has the reputation of thriving where other fruit trees cannot survive.